The telltale black or green spots of mold in carpeting are any homeowner’s nightmare because the moment a mold inspection turns them up; there is an immediate need for clean-up and repair. Before one even needs to undertake the long process of decontaminating and removing the damage, or after it completes, there are many simple steps people can take to prevent the fungi from growing and causing trouble in the first place. The first thing to understand is how mold prefers to grow. It requires a warm, moist and humid environment, such as is found in the home under carpets and in crawlspaces. For mold to grow in carpets it must have suffered water damage or other source of moisture, such as a water based source of carpet cleaning. In the event that the mold was caused by carpet cleaning, it can be prevented the next time by properly airing out the carpet afterwards. Use fans and other sources of open ventilation for as long as it takes to remove all the moisture from the carpet. Only close the room up once you are certain that the carpet has dried completely through to the very bottom. Also, when cleaning the carpet, take care not to use too much water if you are doing it yourself. Flood damage can be another cause of mold in the home. If the basement or other low lying areas of the home become filled with water due to flash flooding, storms, or spring floods, make sure to remove the water as soon as you are able. The longer the water is permitted to sit in the house the more time the mold has to grow and take hold. Use all methods necessary to remove the water and be sure to look carefully for any signs of mold once the area is dry. In this instance, it may be too late to prevent mold from growing, but after removing the damaged carpet it may be time to rethink the type of flooring. If this was a singular event, that may not matter, but for recurring problems consider exchanging the carpet for tile flooring. Mold is a troublesome issue to have in the home but there are concrete steps any home owner can take to prevent it from becoming a problem. 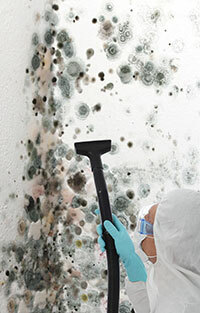 By understanding that mold seeks out moist environments, that moisture needs to be taken away as soon as possible. Whether the water came from a flood or a carpet cleaning, dryness and air are mold’s worst enemies.